Summary: "The Jewel means wealth. The Jewel means beauty. The Jewel means royalty. But for girls like Violet, the Jewel means servitude. Not just any kind of servitude. Violet, born and raised in the Marsh, has been trained as a surrogate for the royalty—because in the Jewel the only thing more important than opulence is offspring. 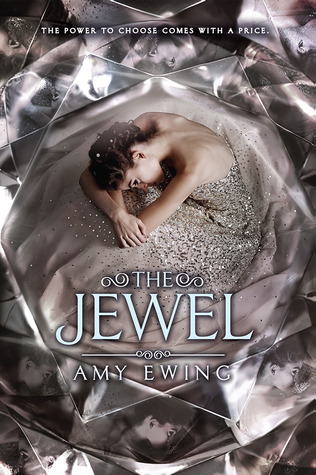 Review: If I ever get asked what is the most mediocre book I read in 2014, my answer will be immediate: The Jewel. For everything positive there is something negative. For every scene I liked there is another scene I didn't like. I didn't love it. I didn't hate it. To me, this story just doesn't stand out in any way. From the summary you'll certainly see parallels to The Selection, Wither, and The Handmaid's Tale. Those parallels are justified, though this book is not as light as The Selection, nor as dark as The Handmaid's Tale, nor as excruciating as Wither. It has problems, but it is at least entertaining. Even if it doesn't hold up well to digestion. There were inconsistencies all over the place within this story. They say that the surrogates are basically property and have no inherent value beyond producing offspring, but when one dies, the surrogate's owner throws a lavish funeral that the entire aristocracy attends. This does not compute. Also, supposedly Violet has been training to be a surrogate for years. She apparently learned nothing in her years of training, because she knows nothing - nothing - about the Jewel, the culture, the people, etc. She's like this wide-eyed, helpless doe at every turn. I get that learning about the Jewel during training and actually being in the Jewel are two different things, but her level of ignorance about every single thing around her was baffling. Plus, this book has the terrible curse of insta-love. I was curious about the characters, despite their inconsistencies. I wanted to know what caused the split between the Lake and her neighbor. (I can't remember her name... the one who bought Raven.) I was curious about Lucien and wanted to know why he wanted to help Violet. (Really, there are so many surrogates, why her?) Without knowing why he wanted to help I was a little suspicious of Lucien, but I liked how he complicated the plot. I thought the Duchess' niece was kind of pathetic. I hoped that she and Violet could be friends, or at least allies, but they seemed determined not to like each other for no reason whatsoever. The romance was the weakest part of the whole book - completely unbelievable - but what it lacked in spark it made up for in suspense every time they were together. Also, there is a twist at the end that makes me want to read the next book. I still don't understand why the upper class needs surrogates at all. We're told that they can't reproduce, or if they do, the children have horrible defects. But I wanted to know why. What caused this? Why exactly was Violet chosen to be a surrogate? Supposedly there is some kind of blood test, but I don't get how that works. I was curious about the three Auguries, but never received enough information about them to get a clear picture of what exactly they were. Frankly, they feel a little like magic. But, if that is the case, why don't the people with magic rule the country? (And how can you tell if someone is "magical" by sampling their blood?) This book asks you to trust it, but doesn't give you a reason why you should. I felt like I was asked to suspend my disbelief too many times for it to truly succeed. I read it in a 24-hour time span. I was truly entertained the afternoon that I read it. There were certainly plot holes, but I had a good time while reading. I feel like I should give it 2 stars because of all of the issues, but this readability made me bump it up a star. It wasn't until after I finished that I realized how many problems there were in this book. So it was attention-grabbing and compelling while I was reading, but lacked substance after I swallowed. Kind of like a potato chip. One with a good opening crunch but an unsatisfying aftertaste. Bottom Line: If you liked The Selection and Wither, then maybe give this one a shot. It will probably entertain you for an afternoon, even though it is, on the whole, pretty mediocre.